Stephen Leek’s distinctive music is immediately recognizable, capturing the enigmas, drama, rhythms, colours and ethos of Australia. He has been accredited with having made a significant impact on and a major contribution to the development of Australian choral composition and performance and how that has been promoted and discussed throughout the world over the past 40 years. Ø And lastly, continue to motivate, enthuse, excite, stimulate, and challenge, always aiming high, never faltering, and truly setting a benchmark for others to emulate. Born in Sydney in 1959, Stephen Leek is an extensively commissioned freelance composer, freelance conductor, educator and publisher. Teaching sessional Composition and Improvisation at the Queensland Conservatorium, Griffith University until 2009 Leek, resigned from this position in order to develop further his already hectic free-lance schedule of commissions, workshops and guest appearances and to take up a non-remunerative position on the Board of the International Federation of Choral Music – a project of UNESCO. He was Vice President of the IFCM until 2017. A pioneer in developing composer residencies, Leek’s involvement with numerous choral and music groups at every level of accomplishment has had vital influence on recent Australian music. In Australia he has been Composer in Residence to numerous leading organisations such as the Sydney Children’s Choir / Gondwana Choirs, The St Peters Chorale, the National Music Camps Association of Australia (AYO), and the Eltham East Primary School Choir, all ensembles that have defined new directions and pathways for Australian music. Leek has also be widely commissioned here and abroad with some of the most recent commissions including The Australian Voices (AUS), The Glen Ellen Children’s Choir (USA), The Adelaide Chorale (AUS), Eltham East Primary School Choir (AUS), SongBridge 2000 (Netherlands), Gondwana Choirs (AUS), the San Francisco Girls Chorus (USA), Taipei Male Choir (Taiwan), Sydney Male Choir (AUS) Kamer Choir – World Sun Songs Project (Latvia) Singapore Chamber Choir (Singapore) to name but a few. Having worked extensively at all levels of Australian and international music-making, Leek has devoted much of his working life to generating workshops and repertoire that stimulates, excites and challenges the very youngest performers to seasoned professionals, putting performance practises and skills in place to enable all ages and skills levels to interpret, understand and appreciate the unique qualities of his music and other Australian composers. From 1989 – 1996, with his improvisational vocal group vOiCeArT, Stephen Leek confronted the Australian music world head-on by throwing out wild challenges to the mainstream about the notion and practices of choral singing. In 1993 he was joint founder, and from 1997 – 2009 Artistic Director/Conductor, of The Australian Voices, an elite ensemble of young adult singers who, through their motivated commitment to the work of Australian composers, have significantly challenged and changed the landscape of choral music in Australia and taken Australian music to the most prestigious festivals and events around the globe. Among Stephen Leek’s array of personal accolades is the award in 2003 of the prestigious Robert Edler International Prize for Choral Music that he received in Darmstadt, Germany. Cited by an international jury for his ‘decisive influence’ on both the Australian music scene and the international choral community as a composer and conductor, Leek has been admitted into the pantheon of leading choral composers and conductors worldwide alongside Conductors Freider Bernius, Karmina Selic, Maria Guinaund and institutions such as the World Youth Choir. He has won numerous other national and international awards for his music including several Sounds Australian Awards, and in 2004, his work “die dunkle Erde” was selected by the Australian Broadcasting Corporation to represent Australia at the UNESCO International Rostrum of Composers in Paris. In 2013 he was awarded the APRA-AMC National Vocal / Choral Work of the Year. In recent years Leek’s activities have expanded more on the international scene where he has been Composer in Residence at the Marktoberdorf Musik Akademy, Germany; Guest Conductor with the acclaimed Formosa Singers, Taiwan, The Crystal Choir, USA, Composer NOT in Residence with Choral Artists of San Francisco, and, Guest Conductor with the Singapore Ministry of Education, The Taiwan National Youth Choir, The Crystal Choir in the USA, guest composer at the Sun Music Festival in Riga, Latvia, a juror at the World Choir Games in Austria, and presenter at numerous music, education and choral Conferences around the world. 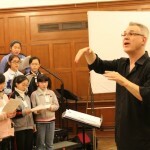 He was also Artistic Director / Conductor of the Shanghai Youth Choir for several years. His list of national and international commissions now reads like a list of “Who’s Who”. With his work regularly being performed by choirs and primarily amateur organisations around the world, Leek is arguably one of the most performed, yet largely ignored by the establishment in his own country. Freelance Australian Composer/Conductor Stephen Leek has long associations with some of the finest and most innovative choirs around the world including Gondwana Voices (Australia), the Tapiola Children’s Choir (Finland), Kamer…Choir (Latvia), The Formosa Singers (Taiwan), and his own choirs, vOiCeArT and The Australian Voices, that he co-founded and conducted for 16 years until 2009. As a conductor, Leek is in demand to work as guest conductor around the globe. As a composer he writes in his own distinctive contemporary style. His works, which have broad appeal and are performed by a wide selection of choirs throughout the world. He has been commissioned by some of the leading choral groups world-wide. Having written 13 operas, numerous orchestral and chamber works, music for education and dance, yet, Leek is often credited as the “founder of Australian choral music” through his composition of over 700 innovative choral works which explore a uniquely “Australian” colour and texture. A Churchill Fellow, Leek has received many national and international awards including the prestigious “Robert Edler International Choral Prize” for his contribution to the development of global choral music. He was Vice President of the International Federation for Choral Music (IFCM) from 2011 – 2017, and in 2012/13, was the Artistic Director of the Shanghai Youth Choir and in 2015, Conductor of the Asia Pacific Youth Choir. Leek still free-lances around Australia and around the world as conductor and composer, but now resides in Gundaroo (outside of Canberra) and is part-time Artistic Director / General Manager of the Young Music Society – an awarded, self-funded, non-profit, community based based organisation that celebrates 50 years in 2019. Note: Although primarily a freelance artist for his entire working life, Stephen Leek has held various part and permanent sessional positions throughout his career and long associations with many leading organizations and institutions, and has managed complex and creative organizations of his own making. Sunnie Award for Best Recording (QLD) and many others…. Consultant to various organisations including Brisbane City Council, NSW Education Department, Musica Viva, Tasmanian Arts Fund, Australian Music Centre, Australian Performing Rights Association etc. etc. …and many, many more organisations, schools, orchestras, theatre companies, dance companies, universities, choirs, professional and community groups across Australia and around the world. …. and at numerous festivals and events around Australia and the world. Numerous articles in magazines such as the International Choral Bulletin, Resonate, Limelight etc. on choral conducting, collaboration, improvisation, Australian music, contemporary trends in choral music, choral training, building a choral sound etc. Australian Choral Music Sampler – Australian National Choral Association…and many, many more choral and instrumental CDs. Currently most of Stephen Leek’s music is available only through the purchase of copying licenses through his website. As a freelance conductor Leek has conducted and worked with some of the leading choirs around the world including The Australian Voices, The Formosa Singers (Taiwan), The Kamer….choir (Latvia), The San Francisco Choral Artists (USA), The Shanghai Youth Choir, (China) The Singapore Chamber Choir (Singapore) the Guangzhou Childrens Choir (China) to name but a few .. in many of the leading choral venues around the world. Performed concerts in high-profile events throughout Australia, New Zealand, Canada, The United States of America, Guatemala, Singapore, Malaysia, Taiwan, China, Hong Kong, The United Kingdom, France, Germany, The Netherlands, Spain, Belgium, The Czech Republic, Hungary, Poland, Croatia, Bosnia etc. Was awarded numerous major medals, prizes and awards including the World Choir Games, Llangollen International Choral Eisteddfod, Bela Bartok Competition, etc..
Organised international and national touring, budgets, Choral and composer schools, festivals, workshops, seminars, commissions, fund-raising, sponsorship, exhibitions, recordings, CD manufacture and design, competitions, scholarships and awards, funding applications, a team of volunteers and staff. Commissioned and premiered more than 70 new Australian works from other Australian composers. 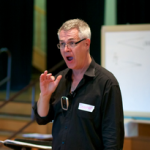 Stephen Leek has, throughout his 30+ years as a professional musician, been at the forefront of composition teaching and developing teaching practices in Australia on several fronts. As a young man in the 1980’s, he developed the Catalogues of Australian Music suitable for educational use that are now used widely and produced by the Australian Music Centre. He has written several kits for schools and community groups on composition, choral music and Australian music, and created two packages of materials for dance education NEWMUSICNEWDANCE, and DANCE MUSIC AUSTRALIA which introduced Australian choreographers and dancers to new Australian music and concepts. He has taught at, lectured at, presented workshops and master-classes, and directed numerous schools, universities, music camps and events specifically for young Australians including the Australian Voices Young Composers School, and the Gondwana International Young Composers School. He has been Composer in Residence to countless primary and secondary schools, universities, colleges, conservatoriums and community groups throughout Australia and the world, where sharing the skills of new music and nurturing creative ideas has been central to his educational activities. Having undertaken more than 150 residencies over the years, he is credited as being the founder of “Composer In Residence” programs in Australia. From 1991 – 2009 Stephen Leek taught Composition at the Queensland Conservatorium Griffith University on a sessional basis and from 1996 – 2009 he also taught Improvisation to the next generation of young musicians at the same institution. Since 2013 he has been sessional Lecturer in the Masters Intensive choral Performance class at the Melbourne Conservatoriu of Music, Melbourne University.